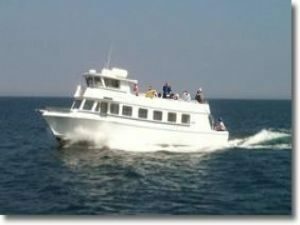 Explore the shipwrecks of Thunder Bay National Marine Sanctuary on the 65-foot glass-bottomed Lady Michigan! Two large viewing wells on the main deck give passengers a front row view of historical shipwrecks on the bottom of Lake Huron. Departing from the warm & friendly port of Alpena, the 65 ft. Lady Michigan will take you on a comfortable adventure into the heart of Lake Huron's Shipwreck Alley. A memorable experience for passengers of all ages! Daily tours begin in June and continue through the color season. Individual tickets can be purchased daily at the Sanctuary Gift Store at the Great Lakes Maritime Heritage Center at 888-469-4696, located at 500 W. Fletcher Street in Alpena. The Lady Michigan docks just behind the Heritage Center in the Thunder Bay River. Group tours are available.